Here at Gunpla 101, more than anything else, we get asked about the way we personally build Gunpla. And we certainly have a lot of opinions about that! 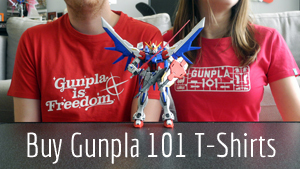 Since launching Gunpla 101 in early 2014 and even before that, we’ve used a lot of different tools on our Gunpla building journey. As our skills evolved, so have our preferences. Now, I’m putting all the tools we’ve ever used in one place and ranking them, so you can see what John, Lauren (that’s me), and our guest contributors like best. These are the Ferrari of nippers. They have the sharpest blade of the bunch, but more importantly, the slimmest. Normally I leave a bit of nub when I cut out a piece, and then shave it off with an X-Acto knife for the cleanest finish. But with God Hands, I can just make two cuts, one while removing it, and another right up against the edge of the piece. At $50 they are pricey for hobby nippers, but it’s better than when they used to cost $100. These nippers were inspired by God Hands and it shows. They have the second slimmest blade of any pair I’ve used. However, the blades are longer and stretch wider than the God Hands, so they’re not as precise. At $35, they’re your best budget bet for a high quality pair of nippers. These Premium Nippers are my “every day” set, good for the daily wear and tear of regular kit building, and I tend to save the God Hands for Master Grade builds and higher. My #1 beginner pick. Get it alone for $20, or as part of a kit with everything you need to build Gunpla for $21. Thick, sturdy nippers that have withstood the test of time (I’ve had a pair since 2013 that haven’t needed to be resharpened), they’re reliable and well-built. Now that I have more precise nippers at my disposal, I use these to cut thicker parts out of sprues so I don’t damage my thinner blades. Another good beginner pick. Tall blades and a wide stretch make for flexibility more so than precision. Built for quality by the same people who make Mr. Hobby paints and tools. The thickness makes them durable, but the angle of the blade makes them relatively sharp. This is a no-brainer. Nine dollars gets you the only three panel-lining pens you’ll need for most builds—black for dark gray and blue parts, gray for white parts, and brown for red, yellow, and brown parts. They’re official Gundam markers, so they were made for this specific task. Another type of official panel-lining pen from Bandai. The sumi-ire brush pen has a wider felt tip that makes it harder to master but offers better coverage if you can figure it out. Not recommended for beginners, but a good artistic alternative to the standard thin tip marker. Before we had access to official Bandai markers, John and I used Micron pens that you can get at your local craft store. The 0.25 mm Sakura micron was a good pick for precision, but we had a hard time getting the right amount of pigment, leading to some seriously dark panel lining. An easily accessible pen for beginners, but nothing special. (Pictured at right.) Contains a file, tweezers, X-Acto knife, side-cutters, and two screwdrivers. I have never used either screwdriver. This is a general hobby kit, not just for Gunpla, which explains the screwdrivers. The X-Acto knife retracts for safety, but you’ll notice that mine has gotten pretty dull and rusty over the years. (Pictured at left.) Contains a file, tweezers, X-Acto knife, X-Acto blade refills, side-cutters, and an official Bandai marker. Distributed by Bluefin, this is the more official of the two kits. A good kit for a beginner that will grow with them. I especially love the inclusion of X-Acto blade refills—I have already broken a blade and had to replace it. The largest can of the bunch, and still comes at a decent price—get it for $24 on Amazon, or $14 + $10 shipping on Gundam Planet. It lasts longer than any other spray can I’ve tried, to the tune of one Master Grade and five High Grades before running out. Tamiya has made a name for itself in the hobby space, so it’s no surprise their spray is effective, cheap, and good looking. One caveat—this spray can be finnickey if you apply it too closely to your kit. Practice on sprues first to avoid a cloudy finish. An extremely forgiving spray that looks good even if you’re not experienced. Very fast drying, too. But it costs as much as Mr. Super Clear and comes in a can half the size. The economy choice. Easy to apply and comes in a big can. The issue is that it has strong-smelling fumes during application. It’s also thinner than the other coats, so you may want to apply it multiple times to make it as flat as one of the other sprays listed.